Archangel Uriel is the archangel who serves on the Sixth or Gold Ray which is the Ray of Peace. Uriel helps us with spiritual understanding and inspiration, problem solving, writing, divine magic, changing thought patterns and healing emotions. Uriel can enlighten our minds with Divine inspiration. 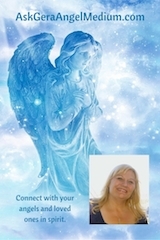 If you need help in solving problems, getting through a block in your writing, or you want to understand a spiritual idea more clearly, you can call on Archangel Uriel to help you. If you have emotions to heal that are stopping you from moving forward, feelings that are blocking your growth and expansion, you can call on Uriel to help you heal those emotions. If you see little sparkles of golden light around you, this is a sign that Uriel is nearby. Have faith that your request for help and healing has been heard, and pay attention to your thoughts. The anwers to your prayers come to you as thoughts and ideas. And Uriel works this way, on very subtle levels. For an extra boost of energy and inspiration, surround yourself with golden light, and allow it to fill you up and shine brilliantly! In this way you help everyone around you to receive this golden light too. That’s what Lightworkers do! Archangel Uriel in Flight, by Glenyss Bourne.